More UK SMEs are selling internationally than at anytime within the last year, with 32% making at least one foreign transaction a month. With many making a foray into international trade, the average value of monthly trades dropped slightly in Q2 to £47,000, but this still represented an increase of 7% from the same period in 2017. Growth expectations grew slightly compared to Q1, but business confidence has yet to pick up compared to the same time last year. 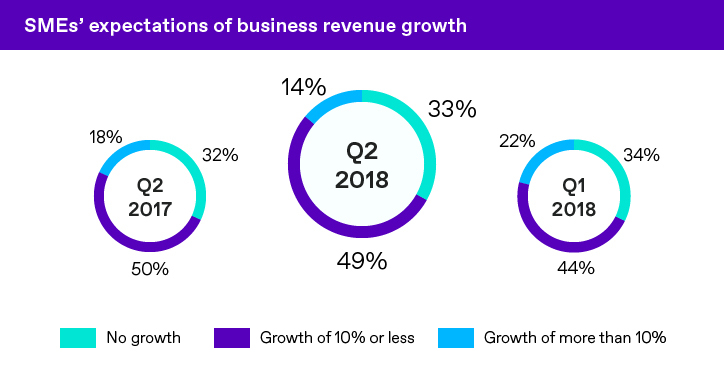 A third of businesses do not expect any revenue growth in the next year. Currency markets have experienced their fair share of turmoil in Q2, with Brexit negotiations and trade tariff woes across the pond all affecting how the world’s major currencies have performed. Wary of making false predictions, hedge contracts booked against the US dollar have fallen by over 50%, and against the Euro by 16%. At the same time, sterling contracts only rose by 3%. 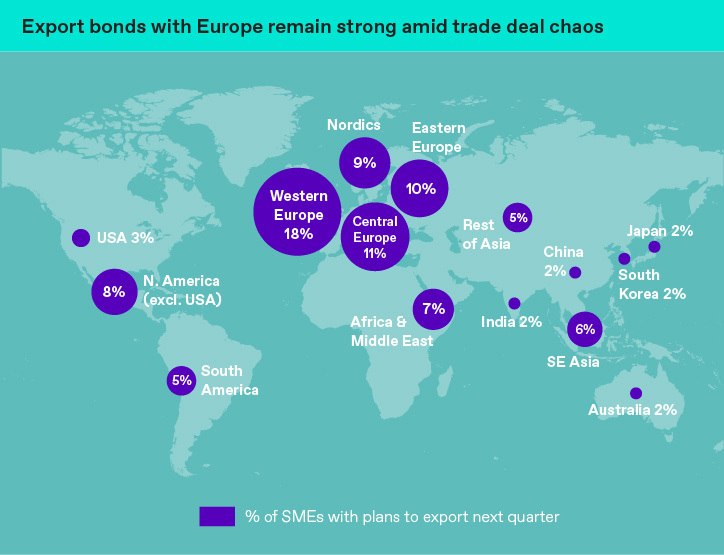 SMEs and trade: Where are we now? 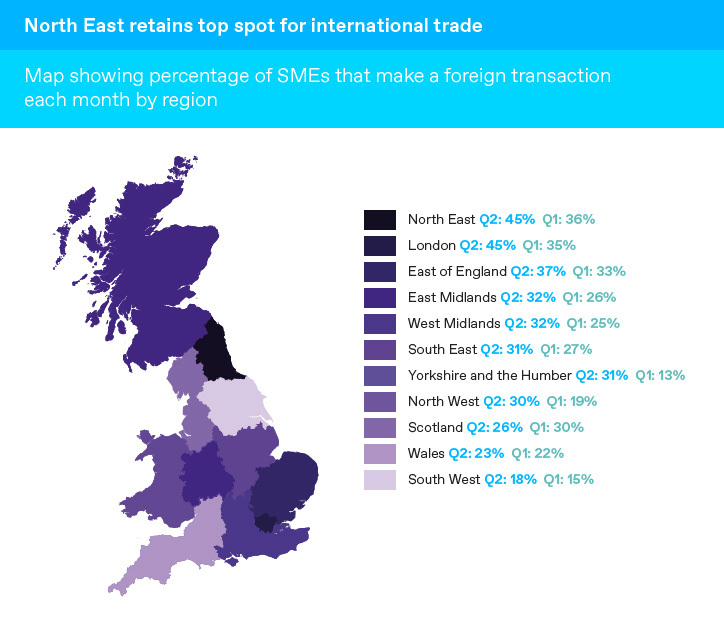 The number of UK SMES trading internationally rose in the last quarter for the first time in a year, with 32% of SMEs making at least one foreign transaction in the average month, an increase of 6% from the first quarter of 2018. Overall, 300,000 more SMEs are doing business in other countries compared to Q1. This rise in currency transactions has been spurred by the increase in medium sized businesses taking advantages of opportunities to do business abroad. 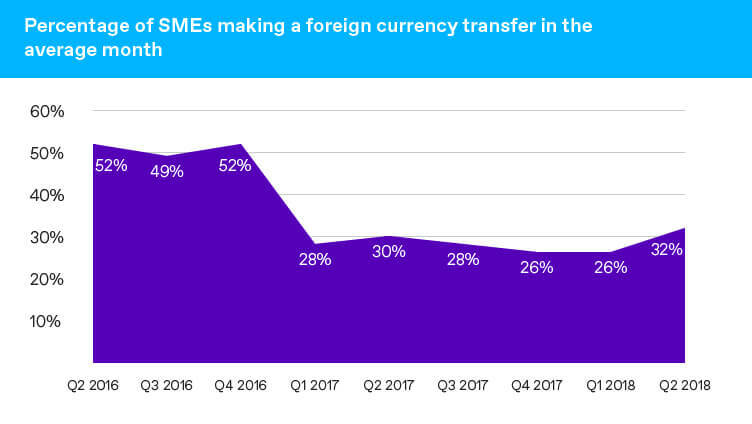 Over half (52%) of medium sized enterprises now make at least one foreign transaction each month, compared to just 37% in Q1. Conversely, the numbers of small businesses rose by only a modest 3%. With more businesses making a foray into international trade, the average value of monthly transactions fell slightly from £48,000 to £47,000. The number of exporting SMEs also grew in Q2 to 34% from 31% recorded in both the previous two quarters. This was matched by a pick-up in the number of SMEs importing, rising to 30% from 26% in Q1 2018. This growth was seen across all regions, with exports increasing to everywhere bar South East Asia and China. The UK’s dependence on the EU for trade shows no signs of abating. A quarter of all SME exports going to Western Europe, an increase by 3% from Q1. The rest of Europe also saw exports increase between 1% and 2%. Payment flows: US, Germany and China are biggest trade destinations. WorldFirst’s own client data shows the US remains the UK’s top trading partner, with 10% of all payments made there. Germany and China complete the top three with no change from the previous quarter. 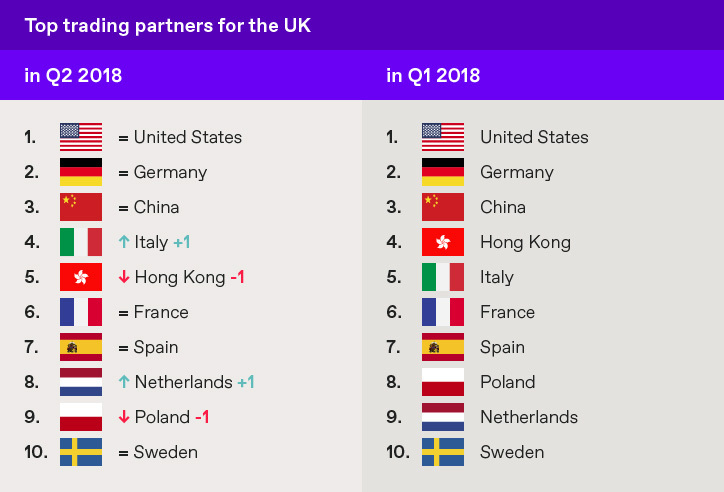 The top countries for trade have remained fairly steady with Western Europe continuing to make the majority of the top ten bar the US, China and Hong Kong. 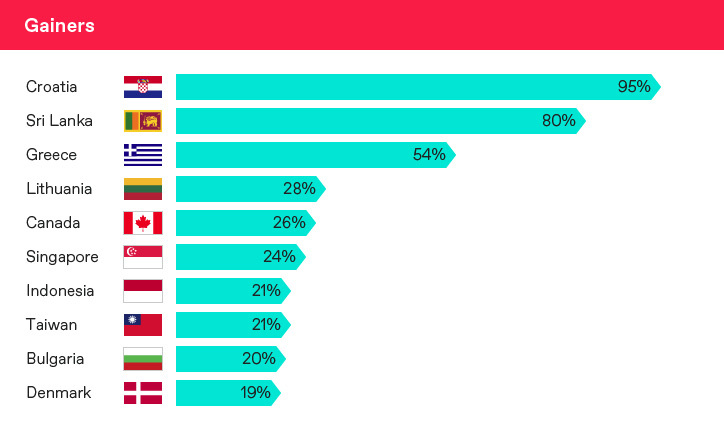 Europe and Asia are also heavily represented in the list of countries which have seen the biggest increase in trade activity, as Eastern Europe in particular saw a large spike in payments from UK businesses. UK to Croatia payments almost doubled in Q2, and big increases were also seen to Lithuania and Bulgaria. There has also been a significant increase to payments to South East Asia with Singapore, Indonesia and Taiwan all seeing growth of over 20%. 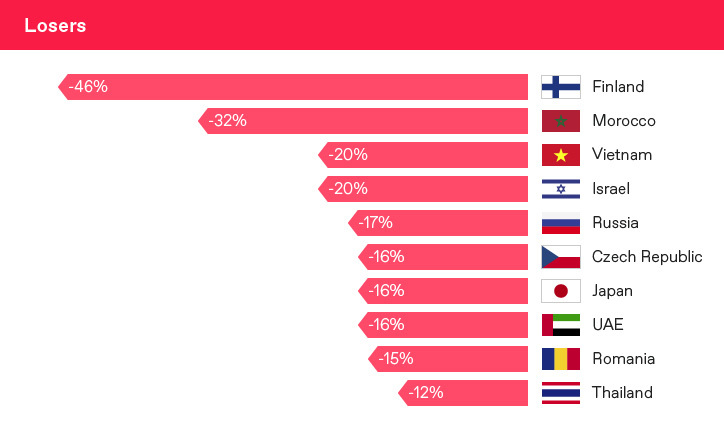 Finland, Morocco Israel and Vietnam saw the biggest falls in payments, but were the only countries to see declines of 20% and over. Future trade: What is next for UK SMEs? More UK SMEs are positive about growth prospects than ever before, according to our survey. 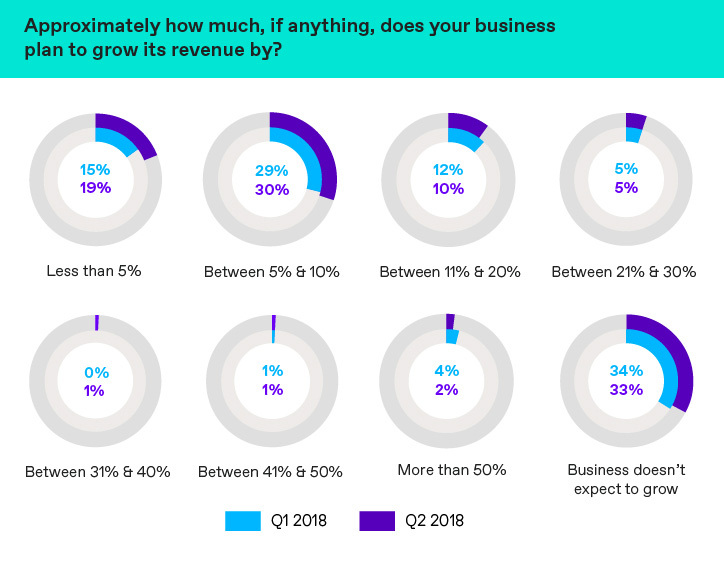 Over two thirds of businesses expect to experience some revenue growth in the coming months and a majority of businesses (30%) expect to grow revenue between 5% and 10%. However, senior decision makers expect this growth to come domestically with many businesses believing international growth will stagnate or decline. 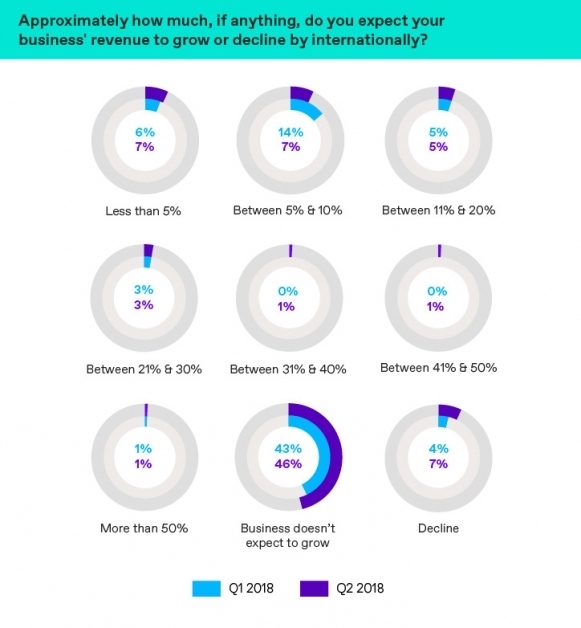 Despite SMEs being wary about international growth, more are looking towards new markets into Q3, with Western Europe remaining the most popular destination for expansion. 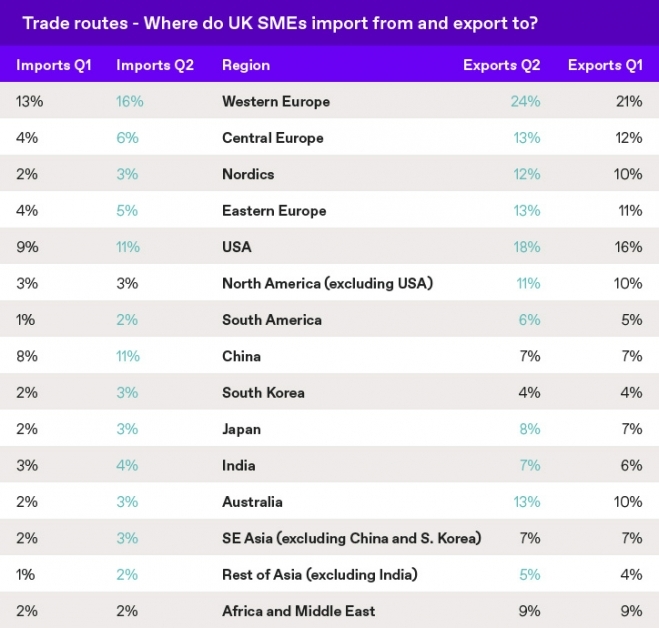 More SMEs want to export, but lack the tools and resources to do so. 47% of businesses identified areas where external help would support their export ambition. 13% of revealed they would export more if they received additional support from the UK government, while another 13% wanted help identifying international business partners. Currency and protection| What’s shaping SME behaviour? SMEs are well and truly spooked by currency markets, unable to take advantage of sterling gains when they appear. Over the last quarter, there has been a significant fall in GBP price index. But this volatility looks like it is here to stay, so SMEs are having to plough on with foreign transactions and hedge contracts regardless. Rather than lock in rates for future transactions, many SMEs are employing a ‘wait and see’ approach to hedging. 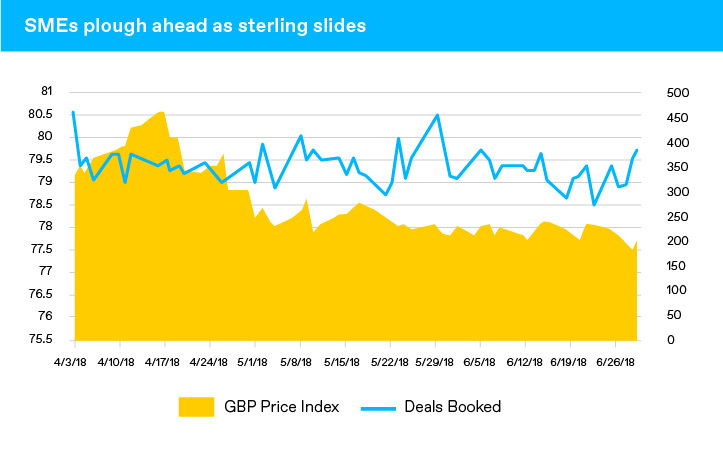 Both the EUR and USD saw significant falls in hedge contracts while GBP saw only a slight increase, compared to the increase in sterling transactions made. The UK government has had a difficult time coming to a conclusion as to what the future of its relationship with the EU will be once the UK exits the Union – and this has clearly affected business’ confidence. 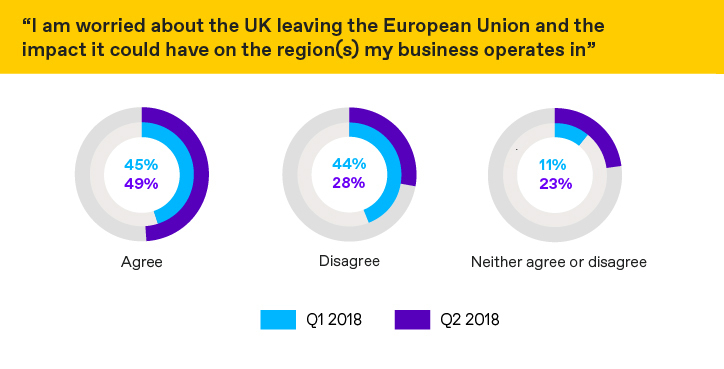 The number of businesses worried about the impact of Brexit increased by 4% in Q2, with the number of businesses who had no worries fell from 44% to 28%. As sterling has borne the brunt of the uncertainty caused by the drawn out Brexit negotiations, more SMEs are aware of the impact of currency movements. 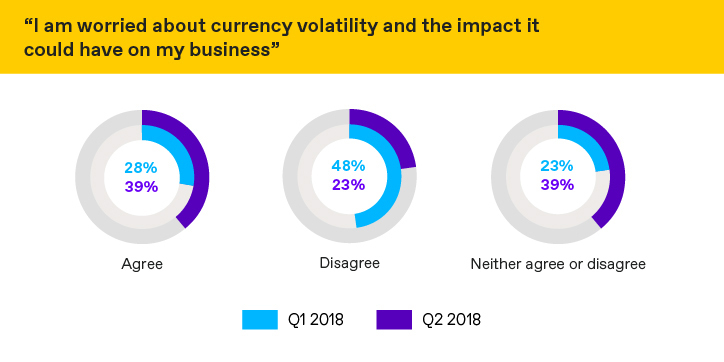 30% of business decision makers confessed to feeling the impact of negative exchange rate movements in Q2, up from 28%. 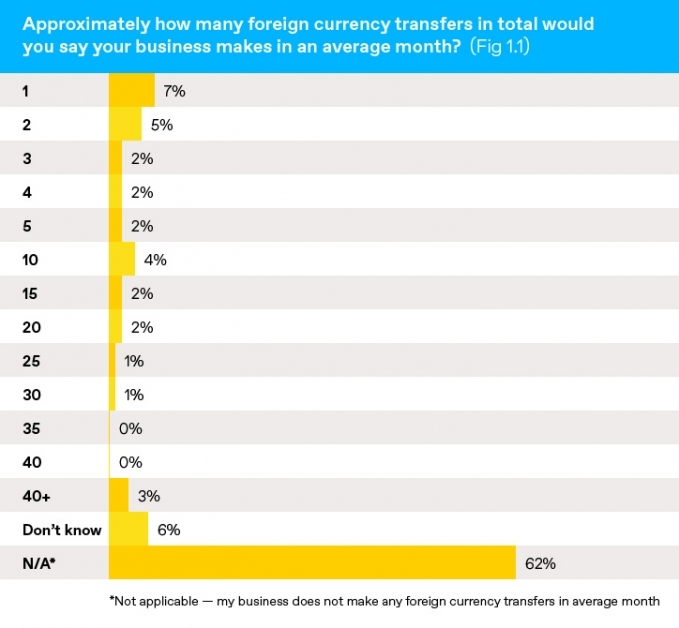 More are also worried about the impact of currency volatility on their business in the future. Despite the Office of National Statistics (ONS) data showing a modest increase in consumer spending in early 2018, a potential drop in spending the biggest worry for most businesses, with 30% expecting such a drop to impact to their business – a rise of 22% from last quarter. Other concerns include a change in government policy, of which 23% of SME decision makers believe will negatively impact their business, and cash flow which was identified by 22% of businesses as a point of concern. Currency volatility has overtaken inflation for the first time in a year as a major concern, with 19% of SMEs worried about the negative impact it could have on their business. The survey was carried out online. The figures have been weighted and are representative of all British business sizes. World First data on client contracts was collated between 1st April 2018 and 30th June 2018 and refers to UK business clients only. A forward contract is a contract to exchange a specific amount of one currency for another on a future date, at a predetermined rate. A deposit is normally required for forward contracts. In this report, ‘FX’, ‘foreign exchange’ and ‘foreign currency transfers’ refer to the buying/ selling of international money (including the payment of international money).